On the occasion the biggest match of Górski’s time in charge of the national team, whenever the ball was in play it would be repeatedly stuck in deep pools of rainwater. In the match of their lives, Poland’s greatest were up against the conditions as well as their highly vaunted opponents. It was a match that would go down in World Cup legend. Poland and Germany are set to renew their almost exclusively one-way football rivalry in the coming days in Euro 2016 qualifying. In 81 years and 18 clashes, Poland had never beaten their neighbours to the west until their first clash in Euro qualifying last October, when Poland’s 2-0 home win heralded great scenes of celebration. They had finally beaten the Germans, but that one result aside, the results have always gone one way. Even that lone Polish victory was perhaps a little unexpected, coming against the recently crowned world champions no less. But Poland’s footballers have on occasion sat alongside their German counterparts on the loftiest of football perches, never more so than at the 1974 World Cup. 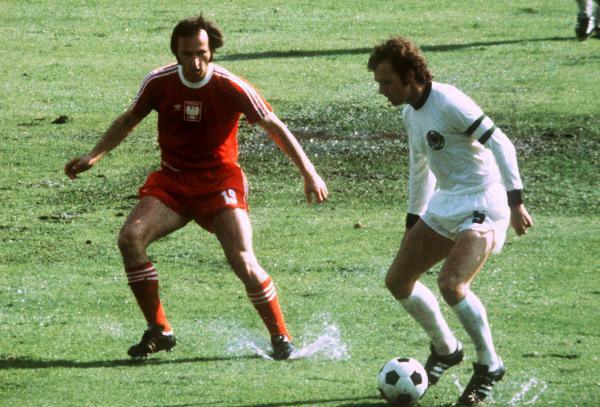 On a torrential day in a sodden German summer, arguably Poland’s finest ever team faced the tournament hosts with a place in the Final itself at stake. This was the Poland of Jan “the Clown” Tomaszewski, Kazimierz Deyna, Andrzej Szarmach and Grzegorz Lato. They were an emerging power of the game, poised to step into something of a golden era. In qualifying for the World Cup they had seen off Alf Ramsey’s England, and at the tournament itself they had won every match so far, in contrast to West Germany who had famously stumbled against East Germany. Topping their opening round group with maximum points – ahead of Argentina, Italy and Haiti – Poland continued their impressive form into the second group stage, from which the group winner would go on to the World Cup Final. Wins over Sweden and Yugoslavia meant that Poland sat level with West Germany with the decisive game to play, but behind the hosts on goal difference. Poland were a real force at the 1974 World Cup, playing fast-paced, free-flowing brand of offensive football replete with short and swift passing combinations. The type of play that is most effective on a good playing surface. Under the leadership of Kazimierz Górski Poland were a team of genuine pedigree. Two years before this fateful World Cup clash, Poland had won the Olympic Games gold medal in Munich, defeating Hungary 2-1 in the final thanks to goals from Kazimierz Deyna (later of Manchester City). With all Eastern Bloc nations being technically amateur in those days, the Olympic squad was largely the same as that which travelled once more to West Germany for the World Cup two years later. Under Górski, Poland had risen from their mediocre past to reach extraordinary highs, with their talented crop of young stars rapidly on the ascent. Their zenith would come at the World Cup. On that summer’s day in 1974, the Waldstadion in Frankfurt was full to bursting with the expectant home crowd. A draw would see West Germany into the final at Poland’s expense. Expectation was high, but so were the nerves. And then the skies opened. In the hours before kick-off the downpour was of such epic proportions that the grass was soon waterlogged. Heavy rain in the preceding days meant that any hope of this latest deluge being absorbed was as forlorn as it was fruitless. Soon enough, the playing surface was covered in an array of widening and deepening puddles, in some places as much as ten centimetres deep. The hopeful and enthusiastic crowd soon morphed into a drenched, uncomfortable and frustrated one. The match was clearly now in danger of not going ahead as planned. 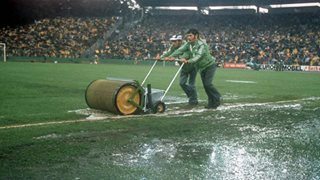 With only a short time remaining until the scheduled kick-off the team of ground staff, equipped with rollers and pumps set to work in the tumultuous rain. There followed some desperate, chaotic minutes as the rollers merely redistributed much of the water, and the pumps drained as much away as possible before soon becoming clogged with mud and grass. Meanwhile the two sets of players, their nervousness increasing with the added stress of not knowing when, or if, the match would start, were pacing around the dressing rooms, or kicking balls against the walls of the tunnel. With a place in the World Cup Final at stake, nobody could sit still amidst the chaos. Some thirty-one minutes after the scheduled kick-off time, Herr Linemayr finally blew for the start of the match. The rain had thankfully relented and the sun had even peeped out from behind the black clouds to herald the delayed start. The pitch had improved to some extent from the deeply waterlogged bog it had become, but there were still many pools of water lying on the surface. This would be no free-flowing slick festival of football. Both teams began in tentative style, the conditions dictating that a cagey approach was best as the players on either side struggled to get used to the conditions. The ball would regularly stop dead in its tracks, gripped vice-like by the water or a patch of soggy mud. Each time a player tried to change direction it was a challenge to stay upright. In the intial flurries, Poland’s slick passing game was negated by the weather more than by the efforts of the German team. It was, at times, farcical stuff. One goal-bound Polish effort stopped dead in a pool of water with the net gaping invitingly. Sepp Maier, in the German goal, also turned away several other efforts, putting in one of his finest performances for his country as Poland threw all they could at their hosts. West Germany had their chances too, but it was Poland who held the initiative in the first half. In the second, West Germany took greater control and, as the match neared the hour mark, earned the perfect opportunity to take the lead when Bernd Hölzenbein was upended in the box by Wladyslaw Żmuda. Uli Hoeness took the responsibility, but his effort from the spot was a weak one. Jan Tomaszewski – known in Poland as a “tiger between the posts” in contrast to his English “clown” moniker – easily made the save, and the scores remained level. No German would miss a penalty in normal time in a competitive match again for 36 years, when Polish-born Lukasz Podolski’s spot-kick was saved against Serbia in 2010. As the waterlogged pitch increasingly resembled a muddy quagmire, churned up by the struggles of the players whose hopes and dreams were being played out on the precarious surface, chances were few and far between. Then with just fifteen minutes remaining, the moment came. Hölzenbein found a bit of space in midfield and threaded a ball through the Polish defence to Rainer Bonhof inside the penalty area. He kept his feet as he turned sharply and laid the ball into the path of Gerd Müller, who took a touch to control before firing home the only goal of the match. It was Müller’s thirteenth World Cup goal, drawing him level with France’s Just Fontaine. More than that it meant West Germany were off for their date with destiny against the Dutch, while Poland were left to rue their ill fortune. They had come close once more in the closing moments, Maier pulling off another magnificent save to keep his side’s lead, but it wasn’t to be. Poland’s greatest ever side had come close, and on another drier day, might have gone on to the final. None other than Franz Beckenbauer agreed, noting afterwards, “Under normal circumstances we probably wouldn’t have stood a chance.” But on the day the circumstances were far from normal. 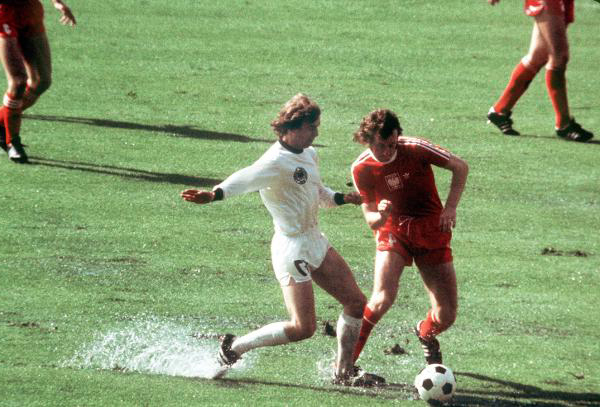 The torrential conditions have led to a number of Polish conspiracy theories over the years, the principal among them being the accusation that only the half of the pitch that West Germany were attacking was properly cleared of water, which conveniently ignores the fact that the teams of course changed ends at half-time. Poland went on to beat Brazil in the third place match to claim their highest ever World Cup finish. Never have they been closer to an international title. They again reached the last four in Spain in 1982, inspired by the talents of Zbigniew Boniek, but a rampant Italian side with a Paolo Rossi-style wind in their sails, were never in danger in their semi-final encounter. 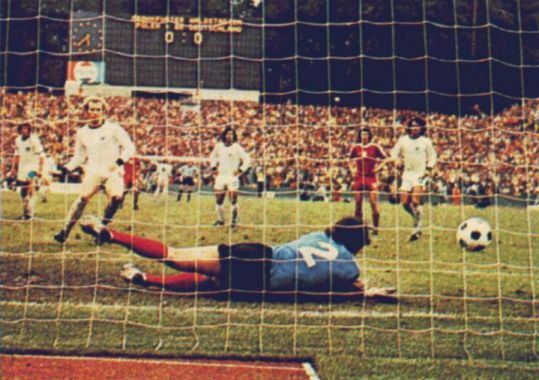 Conversely, in 1974, Poland were a severe rain-storm away from a realistic hope of reaching the World Cup Final. In treacherous, uncertain and decidedly awkward circumstances, Poland gave it their all but fell just short. Until their recent win, it was a sporting rivalry with one perennial victor. The agonising sense of “if only” would linger for years to come, as a team of national heroes emerged from the soaking aftermath of the Water Battle of Frankfurt. Years of enthusiastic sports loving, and a lack of any significant sporting ability, have led me to look at the world of sports writing to share my views and have my say. I write on various blogs and websites, providing analysis, opinions, book reviews and my first book - The Worst in the World: International Football at the Bottom of the FIFA Rankings - is due for publication soon. Excellent analyses, the author knows the history of football very well, with rare inside information. I also remember this match, I am a great fun of football, a match that I will remember for the rest of my life, so much drama in just 90 min. Poland should have won, it was a little bit of a “courtesy” to the hosts. Who knows, maybe Poland will win the semifinal against Germany in the 2018 World Cup in Russia?